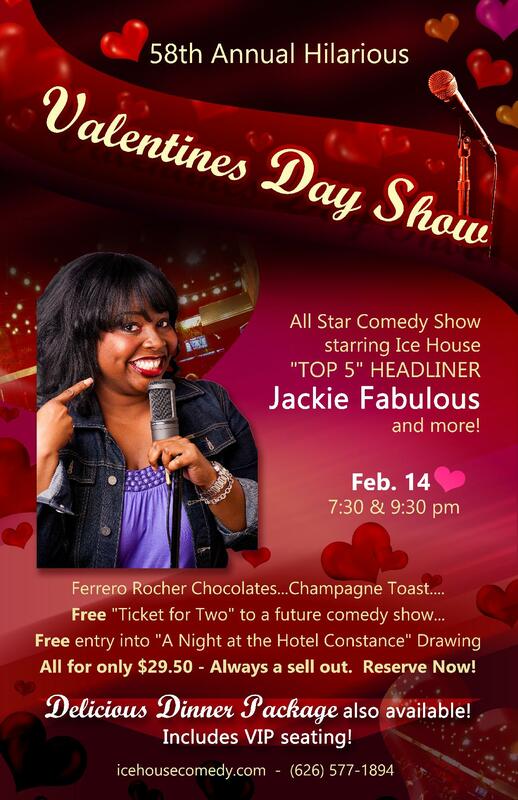 The Ice House :: 58th Annual Valentines Day All Star Show - Starring Ice House Headliner Jackie Fabulous and more! 58th Annual Valentines Day All Star Show - Starring Ice House Headliner Jackie Fabulous and more! With JACKIE FABULOUS, AMY MILLER, JOHN HASTINGS, and ROMAN MURRAY! Amy Miller: Amy Miller was a breakout favorite in Season 9 of Last Comic Standing. Roseanne Barr called her "a star" and a "contender for next alpha female comedian." Keenen Ivory Wayans said she had one of the "fiercest jokes he had ever heard." You may have heard Amy on Doug Loves Movies or the Bennington Show, or seen her at the Bridgetown Comedy Fest, Riot LA Festival, or at San Francisco Sketchfest. Originally from Oakland, California Amy found her comedy chops in the Bay Area scene and is still a favorite at the San Francisco Punch Line and Cobb's Comedy Club. After a move to Portland, Amy won Portland's Funniest Comedian in Helium Comedy Club's contest, as well as being voted Portland's Funniest 2013 and 2015 in the Willamette Week.